Throwback Thursday! This recipe is from waaaay back when I first started blogging and had no idea what to do with a camera. Every Thursday I’ll be featuring an “old” recipe with a little makeover! 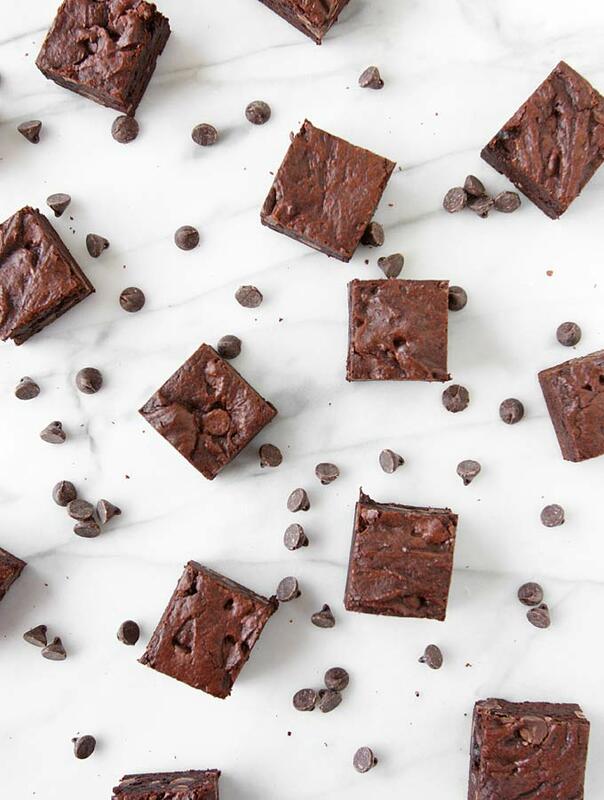 These brownies are my “go-to” brownies — I use them as a base for any brownie variations (like these or these or these). They’re fudgey — not cakey — and SUPER chocolatey! THE BEST! The rest of this post is from the original way back when! 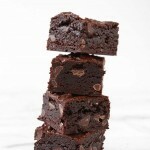 So, I don’t really have a brownie recipe on the blog yet. Weird? Yes. I have cream cheese caramel swirl brownies and the infamous brownie cheesecake, but no plain brownies! 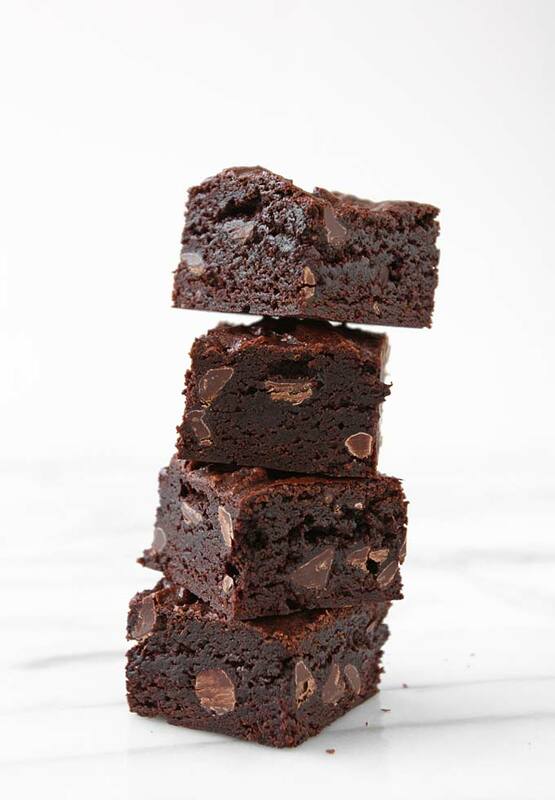 And no super-awesome-totally-my-favorite-delicious FUDGE brownies! Brownies should be dense: I demand it. Cakey brownies are, well, just cake. If I wanted cake, I would make cake. But I want brownies, so damnit give me dense brownies! These babies do just the trick. 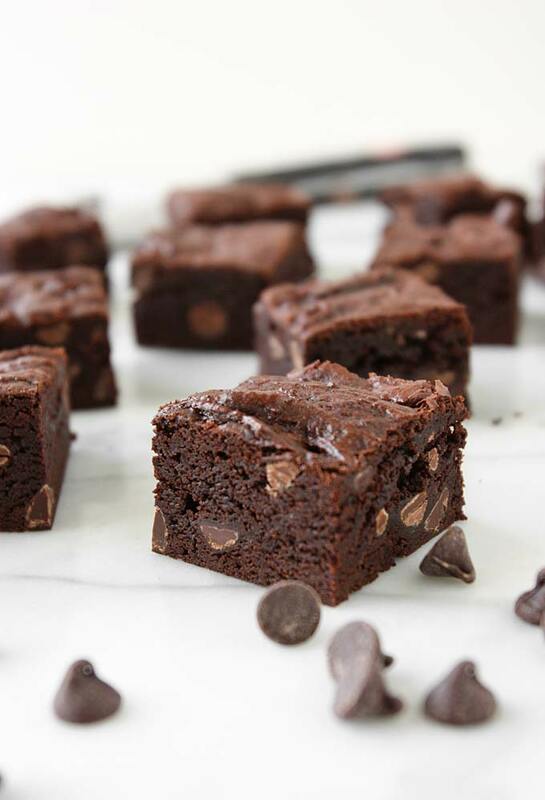 They’re dense, double-chocolatey, and pretty much amazing. Preheat the oven to 350 F, and lightly grease an 8×8″ pan. In a saucepan over medium-low heat, melt the butter. Once melted, add the sugar and cook for another minute. Remove from heat and add the cocoa and salt. Stir to combine. Add the vanilla, and then the eggs one at a time. Whisk fully so that the mixture is smooth and glossy. In a separate bowl, combine the baking powder, espresso powder, and flour. Add to the wet ingredients, mixing until just combined. Stir in the chocolate chips (if you want them fully intact, let the mixture cool 10 minutes before doing this step). Spread the mixture into the prepared pan and cook for 25-30 minutes – the top should have a thin crust, but the center will still be quite moist. Let cool 20 minutes before cutting and serving. I agree with your brownie philosophy!!! Fudgey over cakey for sure!! Good luck with the marathon!! Please let me know how it goes!! Have a wonderful time!! I hope you can appreciate the beautiful scenery!!! I can’t wait to hear about it when you return. Thanks, Elizabeth! I’m really looking forward to the scenery – everyone says it’s just amazing! 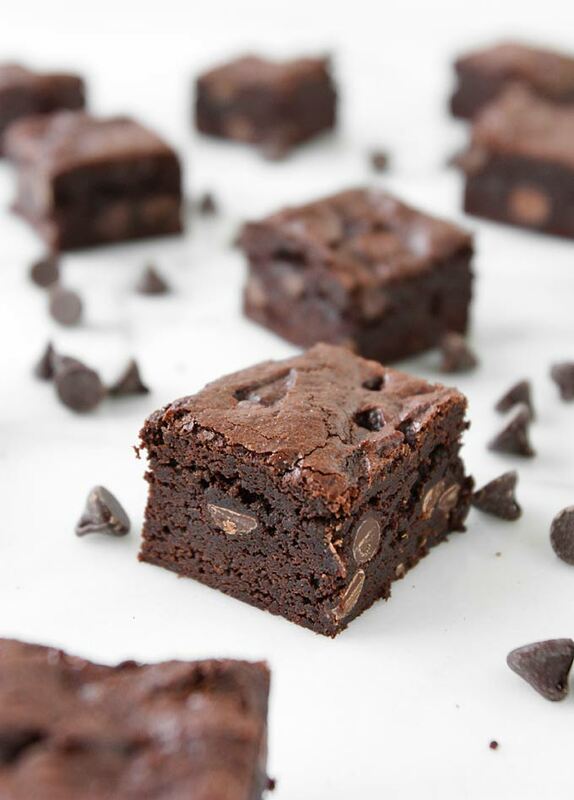 these look like the perfect brownies, I doubt you not.